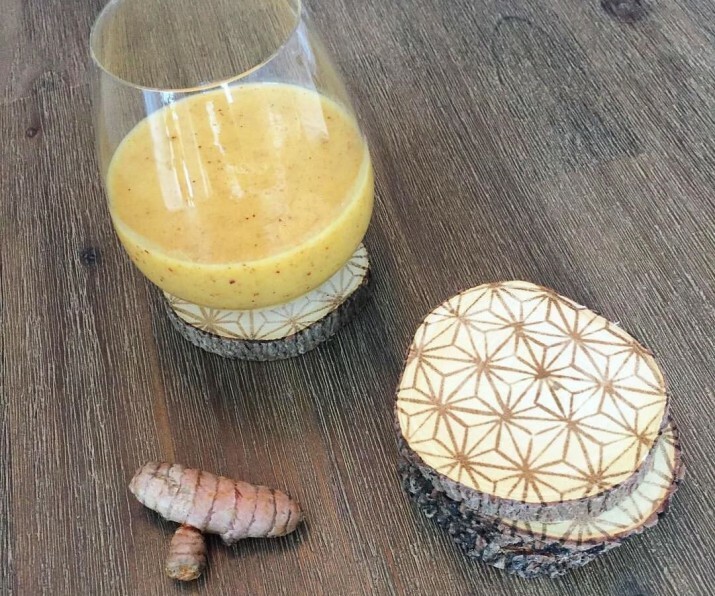 Check this tropical turmeric smoothie – delicious! Anyone who has trained with focus and intensity for an athletic event knows that the faster you can recover from your training session, the sooner you can train hard again. Being able to train more intensely and consistently is the secret to better performance. This is not only true for athletes. Weekend warriors, entrepreneurs, and busy people of all types need to keep their bodies healthy to ward off the effects of stress and less than optimal eating can cause. This intense yellow root is all the rage now. It is the secret ingredient in golden milk and anti-inflammatory elixirs popular in trendy restaurants and juice bars. But turmeric is not just some trendy hokum, as might be said about other magic potions… I’m looking at you coconut oil and activated charcoal! There is some serious research to back up the miracles of turmeric. This vivid yellow root boosts your cancer-fighting defenses while reducing inflammation and oxidative damage all over your body. I can help with arthritis and diabetes. It can even speed healing after surgeries! So powerful is its positive impact on health, even in small doses, Dr. Micheal Greger, MD includes it as one of his daily dozen foods to eat every single day. Even before it became a trend and a scientific wonder, athletes under extreme physical demands used it as a recovery aid. Famed plant-based ultra-endurance athletes such as Rich Roll, Brendan Brazier, and Scott Jurek all enjoy its benefits. I personally have used turmeric to great effect when recovering from exercise and injury. Most recently it has helped me very quickly deal with the intense pain of a back injury. Yet, I have always struggled to find a way to include the spice in my daily regiment. Sure, it’s in most of the curries that I make, but I don’t make curry every day! I just don’t find that turmeric goes that well in many foods. Part of the problem is that I was using dried turmeric. You will achieve similar health benefits from dried turmeric, but the taste is something like you’d find in the toe of an old boot in your grandfather’s attic. Dusty, musty and just slightly reminiscent of dirty socks. I recently found fresh organic turmeric root at Farm Boy. Hands down, it’s a game changer. The last is not only tolerable, it’s delicious. It has a bright flavour, reminiscent of citrus such as lemon and grapefruit, which makes it perfect for tropical style fruit smoothies. One thing to know about turmeric is that it doesn’t always absorb it into your bloodstream. While it can work wonders placed directly on human cells in a petri dish, unless it gets to your own cells, you won’t get the benefits. Interestingly black pepper, also typically used alongside turmeric in traditional Indian cooking, has been found to dramatically increase absorption. Apparently, the ancients knew this all along… or these two spices just taste particularly good in a curry. We’ll never know! The bottom line is, a little twist of pepper will go a long way in your turmeric creations. Don’t worry, it only takes a small amount. Your smoothie need not taste peppery. The following tropical smoothie is delicious! It’s not particularly high in calories, so I personally don’t treat it as a meal in itself, but it makes a great post-workout snack or a little something when you need a pick-me-up. It also contains ginger, another anti-inflammatory powerhouse. Try it during times of heavy training, stress or injury, and see what a daily dose of turmeric does for you! Place all ingredients in blender and blend until smooth. For a smoother consistency, try blending the mango, date, ginger and turmeric until smooth, then add the banana and pulse blend until smooth. By not over blending the bananas, you will keep them from oxidizing and retain their sweetness. Fat Loss Myth Debunking: Part 1 – Do Your Research!